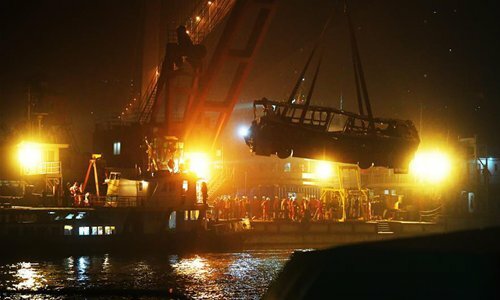 Local governments across China are exploring stricter measures to protect drivers and harsher punishment toward ill-behaved passengers, after a woman attacked a bus driver before the bus plunged into the Yangtze River in Chongqing Municipality, killing 15 people. Surveillance video showing the woman, who had missed her stop, hitting the bus driver with her mobile phone has caused outrage on China's social media. The driver fought back and lost control of his bus which then ploughed through the guardrail and plunged into the river below. After the tragic incident, many cities are in the process of upgrading buses to protect drivers from passenger interference. Nanjing, capital of East China's Jiangsu Province, promises to install doors that separate the driver from the passengers on some 8,000 buses by 2019, People's Daily reported. Wuhan of Central China's Hubei Province will replace 6,100 older buses with new models equipped with protective doors by 2025, local newspaper Wuhan Evening News reported. A local court in Shenyang, Northeast China's Liaoning Province sentenced three individuals to up to three years in prison with reprieve. All three had physically clashed with bus drivers, causing traffic accidents or injuries to passengers, the Xinhua News Agency reported on Sunday. Many furious netizens suggested that traffic laws should allow other passengers to restrain ill-behaving passenger and keep them away from the driver. A young man who did so in Central China's Hunan Province was applauded online following the Chongqing incident. Some net users said guards should be employed to protect bus drivers. Beijing, as a pioneer, has security staff on all its buses to ensure driving safety, Shanghai Observer reported on Saturday. "Passengers who interfere with bus drivers are endangering public safety, which is equal to serious crimes like arson and poisoning," Liu Changsong, a Beijing-based lawyer, told the Global Times. People who commit arson or poisoning can face prison terms of between three and 10 years or even the death penalty, according to China's Criminal Law. "People usually escape punishment if nobody reports the case and legal organs do not intervene," Liu noted, suggesting that bus drivers facing such situations should immediately call the police. "Such strict punishment is also aimed at educating the public," Liu said.